Contains patterns and instructions for creating 14 projects. Designs include 8 fish, 3 lighthouses, 1 sea turtle, 1 sailboat and gull, and 1 scuba diver. Pieces can be created with fused or stained glass. Fished color photos shown for most projects. Contains a collection of stained glass projects to help you capture those magical moments. Choose from 28 different stained glass projects. Included are a palm tree night light, colorful flip flops, surfboards, margarita glasses, coral fan and more. Shown in full color. Contains 7 full size patterns of lighthouses from the coasts of America. Each lighthouse and its surrounding land or waterscape can be overlaid a single piece of background glass. Instructions, tips and color photos are included. 14 amazing boat designs that are so lifelike, you can just feel the rolling waves beneath your bough. All patterns are useful in panels or freeform projects. 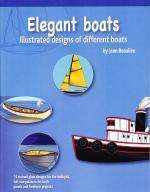 Designs include many sailboats, rowboats as dawn and night, a galleon, regatta sailboats, canoes, and a tugboat. Over 80 boldly outlined, handsomely rendered designs of marine animal life: butterfly fish, humpback whale, dolphin, sea anemone, snails, sea horse, jellyfish, sea gull, osprey, penguin, octopus, sea turtle, walruses, and more. Perfect designs for windows, panels, mobiles, lampshades, mirrors, lightcatchers, and other glowing works of art. 64 pages. 12 Illustrated designs of the wonders of the sea. Patterns include a seashell, a seahorse, angle fish, dolphins, betta fish, and more. Designs are excellent for panels or for use in freeform projects. Color photos of each design is included. Includes 100 attractive, workable patterns for stained glass crafters at all levels. Featured scenes include: lighthouses on rocky coastlines, graceful seashells, majestic sailing ships, playful dolphins, and other maritime subjects. Designs offered in circle, oval, rectangle and square. 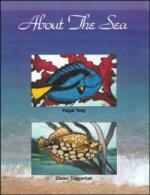 Features 17 patterns of seashells and other sealife. Projects include a variety of things you might see when strolling along the seashore… seashells, sand dollars, a crab, or starfish. 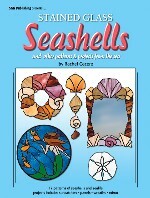 In addition to suncatchers, there are a couple of panels featuring underwater scenes, several unique seashell wreaths and a mirror project with a seashell border. All projects are shown in full color; tips and hints are included.